No Fenders -Formula 1, IndyCar and A Whole lot more..: Congratulations ‘Hinch! 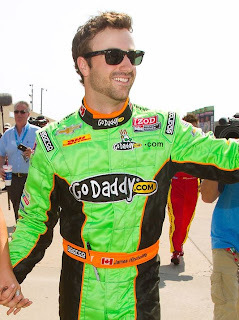 So thee Mayor ‘O ‘Hinchtown, aka James Hinchcliffe has finally “Cracked-his-Duck” as those Bloody Limey Brits would say; Hya! En route to the first of his many IndyCar victories... And in turn doing something for his sponsor what Queen Danica couldn’t do - as in claiming victory! Which obviously is not only great news for Mikey & Co. but IndyCar too, as this popular first victory should only increase his odds of cementing himself as the new face of Canadian drivers in Open Wheel Racing - as isn’t it ironic that Canada’s favourite son Paul Tracy was on hand calling the race for our frozen neighbors north of us, eh? CONGRATS ‘HINCH - KEEP ‘EM COMING!